Ready to use after opening. Consume soon after opening. 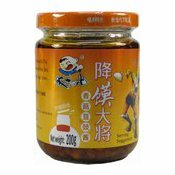 Ingredients: Vegetable Oil (Rapeseed Oil), Mushroom (34.7%), Black Bean (Black Soybean (Black Soybean, Water, Salt)) (12%), Soybean Paste (Soybean, Salt), Preserved Pepper, Sugar, Spice, Flavour Enhancer (E621). Simply enter your details below and we will send you an e-mail when “Mushroom With Black Bean Paste (飯掃光香菇豆豉醬)” is back in stock!